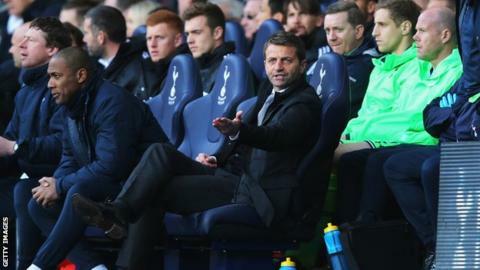 Tottenham boss Tim Sherwood will return to the dugout for Monday's home game with Sunderland, but maintains he can learn more watching from the stand. Sherwood has spent time away from the technical area since clashing with Benfica coach Jorge Jesus on 13 March. "I'll be on the touchline on Monday. I'll be knocking out as many people as I can," Sherwood said with a smile. "I've had a lot of time to prepare this week. If [the players] don't know what it's all about, they ain't going to." Spurs fans, disenchanted by their side's performance in the 4-0 defeat at Liverpool on 30 March, chanted: "Where is our manager?" in reference to Sherwood's decision to watch the entire match from the stand. "Against Liverpool, I feel there was a technical mismatch between the two teams," he said. "There was nothing we could do to turn it around, unfortunately. "I can learn more about my players for the future sitting up top than going down there to the touchline. "I would've had no effect on that game [against Liverpool]. Against teams we've got left to play, the players know the script now." Sherwood took charge following the dismissal of Andre Villas-Boas in December and won three of his first four league games. However, Spurs have since been beaten at Chelsea and at home by rivals Arsenal, and are currently out of the European places in seventh, although they are only a point behind Manchester United with a game in hand. Kyle Walker, Etienne Capoue and Erik Lamela remain unavailable for Monday's Premier League encounter with strugglers Sunderland, and are joined in the sidelines by Roberto Soldado and Jan Vertonghen. "We will play the same way between now and the end of the season and it's up to them to try to entertain," added Sherwood, whose rein has been beset by continual speculation about Netherlands coach Louis van Gaal being brought in to replace him. "I'll be there at the forefront with them and hopefully we can get a positive result together."